In the sixth century before Jesus, religious and political corruption had caused the Jews to lose their homeland and go into exile. New leaders struggled to restore the peoples' identity by reminding them of their noble origins, centuries earlier. They describe Moses describing a way to tell that story at a regular ritual. The letter to the Romans contains a long argument about why Christians do not need to keep the Law of Moses, since God has chosen to save us in Christ by grace. This short passage explains how to avail ourselves of that gift. The evangelists Mark, Matthew and Luke each describe first the preaching of John the Baptist, then Jesus' own baptism followed by a desert fast and period of temptation, then the beginning of Jesus' public preaching. We traditionally begin lent with the gospel about Jesus' temptations. The recitation of the people's history. Our modern rituals have this structure, too (although we reverse the order). As lector, your job in our contemporary ritual is to recite our history from our certified book of memories. The Literary and Historical Setting: Though it describes events set in the time of Moses, Deuteronomy was written much later, during the Exile, 587-539 B.C.E. (also known as the Babylonian Captivity). Internal corruption and external pressures had brought the people to the brink of extinction. Kings, priests, prophets, and temple had all failed to hold them together. The writers responded to this crisis by re-interpreting ancient legal traditions, putting them in the mouth of the great lawgiver Moses, in the hope of setting the Jews on a viable course for their future. On the surface, it's a story of origins. In its real purpose, Deuteronomy is about starting over, hoping to get it right and keep it going this time, where "it" is national identity expressed through loyalty to God's law. The ancient reciter of this even more ancient history knew this story was his own, so he can only speak in the first person. It's "my" father, it's "we" who grew numerous, it's "us" whom the Egyptians oppressed, it's "our" cry that God heard, it's "us" to whom God gave this land, etc. That audio clip comes from The Bible Workshop. This and All Your Proclamations: Here is another clue about how to be a lector. When we assemble on Sunday, one of our goals is to decide how to be God's people in the present, but in continuity with our tradition. We trust that by remembering how God dealt with us in the past, we'll discern God's promptings among all the confusing opportunities in our present. Formed and informed by our past, we hope to pick a right path through our future. So the recitation of our history is not optional icing on the cake. Lectors and preachers have to take their work most seriously, letting the Spirit work through them and their attentive listeners, lest the church lose its way. So what's the best way to proclaim this reading? Well, you have to mentally be Moses giving these directions. And assume that Moses tried mentally to be the storyteller whom he was instructing. So you're telling your own people their own story. If this mental role-playing seems out of your reach, try imagining an elder telling his or her grandchildren how the family came here from the old country, or how the family's business was formed. Or recall those "how we met" stories you used to see in Ann Landers' column. One of the above should put you in the right frame of mind. The Theological and Historical Setting: To understand this passage, we need to take two steps back, asking the purpose of the whole letter to the Romans, then a step forward to examine chapters 9 through 11, a distinct unit within the letter. In Romans as a whole, Paul asks how we are justified in our relationship with God. Here "justified" means made right with God. Among the early Christians, many converts from Judaism insisted that Gentile [Paul calls them "Greek"] converts to Christ had to, in effect, become Jews first and keep the whole Jewish law, and this would make them right with God. Now Paul had tried that, as he says in the moving autobiographical passages of the letter to the Philippians. It never justified him before God, and his conversion to Christ taught him that none of us can achieve righteousness on our own, now matter how well we keep God's laws, or how much we pray, etc. In the letter to the Galatians, then in Romans, Paul argues that God offers us a share in divine righteousness as grace, which means a purely free gift, to which we contribute nothing, and which we in no way earn. We have only to accept it by putting our faith in Christ. The Law of Moses had long served the Jews, and they honored God by trying to keep it, but keeping it was never able to give them full righteousness before God. On the contrary, being impossible to keep fully, the law in effect condemned them. Only the gospel gives the possibility of righteousness and life. Brothers, my heart's desire and prayer to God on their [the Jews'] behalf is for salvation. I testify with regard to them that they have zeal for God, but it is not discerning. For, in their unawareness of the righteousness that comes from God and their attempt to establish their own (righteousness), they did not submit to the righteousness of God. For Christ is the end of the law for the justification of everyone who has faith. Moses writes about the righteousness that comes from (the) law, "The one who does these things will live by them." But the righteousness that comes from faith says, "Do not say in your heart, 'Who will go up into heaven?' (that is, to bring Christ down) or 'Who will go down into the abyss?' (that is, to bring Christ up from the dead)." But what does it say? "The word is near you, in your mouth and in your heart" (that is, the word of faith that we preach), for, if you confess with your mouth that Jesus is Lord and believe in your heart that God raised him from the dead, you will be saved. For one believes with the heart and so is justified, and one confesses with the mouth and so is saved. For the scripture says, "No one who believes in him will be put to shame." For there is no distinction between Jew and Greek; the same Lord is Lord of all, enriching all who call upon him. For "everyone who calls on the name of the Lord will be saved." Finally, Proclaiming It: Now you know the context, and you have only to proclaim it intelligibly to many people, of whom only a few will know the context. And this on the Sunday when you'll be instructed in the gospel, "You shall not put the Lord, your God, to the test!" I recommend emphasizing the sentence "if you confess with your mouth that Jesus is Lord and believe in your heart that God raised him from the dead, you will be saved." It's basic, it's concrete in what it asks people to do, and it's seasonal. 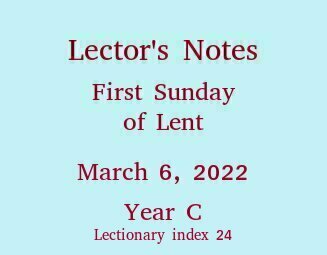 Vanderbilt University in Nashville, Tennessee, U.S.A., publishes web pages of the readings in the Revised Common Lectionary (R.C.L.). That calendar of readings is very similar to the Roman Lectionary. That similarity is a great step toward Christian unity because it causes Catholics and Protestants to proclaim the same readings on most Sundays. 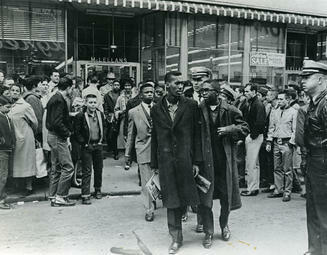 The civil rights protests were part of a very long struggle by American descendants of slaves brought from Africa to gain equality. It seems perfectly appropriate to express solidarity with them on the day when our lectionaries remind us of the legacy of Hebrew slavery in Egypt: "When the Egyptians treated us harshly and afflicted us, by imposing hard labor on us, we cried to the LORD, the God of our ancestors; the LORD heard our voice and saw our affliction, our toil, and our oppression."